In an effort to reach out to youths in the Syracuse community, the University’s music education program has partnered with El Punto Art Studio, a contemporary arts education program offered at no cost to children and teens. The music education program is affiliated with both the School of Education and the Setnor School of Music in the College of Visual and Performing Arts, while El Punto Art Studio is a program designed by the Syracuse-based Punto de Contacto-Point of Contact, offered in collaboration with the Spanish Action League and La Casita Cultural Center. This new partnership will enable the creative exploration of music and sound for El Punto’s participants this spring. 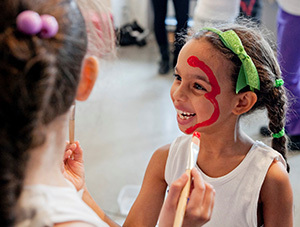 El Punto is an experimental workshop in contemporary arts for children and teens in Syracuse. This hands-on art practicum is designed as an exploration in the literary, visual and performing contemporary arts with the participation of local and guest artists. The program this year will include music education workshops under the guidance of Elisa Dekaney, chair of music education, and students Jamie Yavorsky, Anna Lilikas and Ashley Orifice. Illustration workshops will be guided by Associate Professor of Art Yvonne Buchanan and acting workshops by drama student Julian Fernandez. The workshops are open to the first 65 students who sign up. This program is open to youths between the ages of 6 and 16. Workshops take place every Saturday from 1-4 p.m. at various locations, mainly at La Casita Cultural Center and the Point of Contact Gallery on the Near Westside of Syracuse. To sign up, participants can call Point of Contact at 315-443-2169, or email pointofcontactgallery@gmail.com. “For the students and programs in the School of Education and the Setnor School of Music, having a place to teach, develop curriculum ideas and try bold moves and actions in music education is priceless. I believe Syracuse University students will benefit from having the opportunity to learn how to teach youngsters and also learn from and with the children who want to engage in artistic projects through the Point of Contact Gallery,” says Dekaney, who will oversee that part of the program. El Punto is an interdisciplinary arts program designed in collaboration with top-rated guest artists in a multicultural setting. The program consists of six weeks of Saturday workshops from March 21 to April 25. This year, the program will culminate with a live performance and exhibition at the Point of Contact Gallery and the production of a digital and printed illustrated storybook with CD recording included, featuring the youths’ own stories accompanied by their own music.